Approximately 40 per cent of Cameroon is forested. Yet more than three million hectares of Cameroon’s forests have been cleared since 1990 – an area approximately the size of Belgium. The forest area is now coming under intense pressure from new foreign investment in mining, agriculture and associated infrastructure development. In addition, the lack of social benefits generated has been a recurring theme in recent evaluations of forest sector development programmes over the past decade. Indigenous peoples suffer additional rights violations because of endemic discrimination against them. AJESH (Ajemalibu Self Help) is a civil society organisation founded on June 4, 2006. 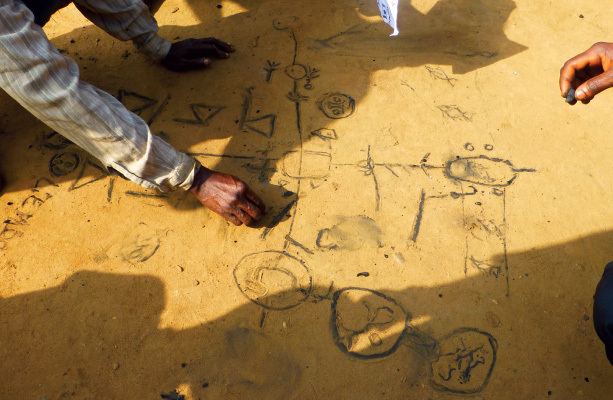 AJESH are located in Nyasoso, Cameroon and work with local and indigenous communities in the South West region. RFUK's partnership with AJESH began in 2014 and together we have worked on issues including: participatory mapping, land and resource rights of forest peoples, and land planning (zoning, land reform). APED (Appui pour la Protection de l’Environnement et le Développement) are located in Kribi, Cameroon and work with local and indigenous communities in the South forest region. APED aims to improve the living conditions of forest communities and the conservation of natural resources. APED's partnership behan in 2014 and together we are working on the following issues: participatory mapping, land and resource rights of forest peoples, and processes related to land planning (zoning, land reform). APIFED (Appui à l’autopromotion et l’insertion des femmes, des jeunes et des désœuvrés) are located in Djoum, Cameroon. APIFED aims to contribute to improving the socio-economic position of vulnerable groups, working with local and indigenous communities mostly in the region of Djoum. RFUK's partnership with APIFED began in 2014 and together we are working on issues including: participatory mapping, land and resource rights of forest peoples, and processes related to land planning (zoning, land reform). CED (Centre pour l'Environnement et le Développement) are located in Yaoundé, Cameroon. They aim to contribute to the protection of rights, interests, culture and claims of local and indigenous forest communities of Central Africa, through the promotion of environmental justice and sustainable management of natural resources. RFUK's partnership with CED began in 1999, and we have previously worked with them on projects including participatory mapping, sustainable conservation, and legal capacity building with local communities. FODER (Forêts et Développement Rural) are located in Yaoundé, Cameroon and work with forest communities in the country, with a focus on monitoring forest activities, corruption and governance. FODER's mission is to create an enabling environment for sustainable development.